The Pray Across Missouri initiative has been a delightful experience for Sharon and me. I appreciate state missionary Spencer Hutson’s hard work to do the front work of scheduling these events in 114 counties plus the City of St. Louis. 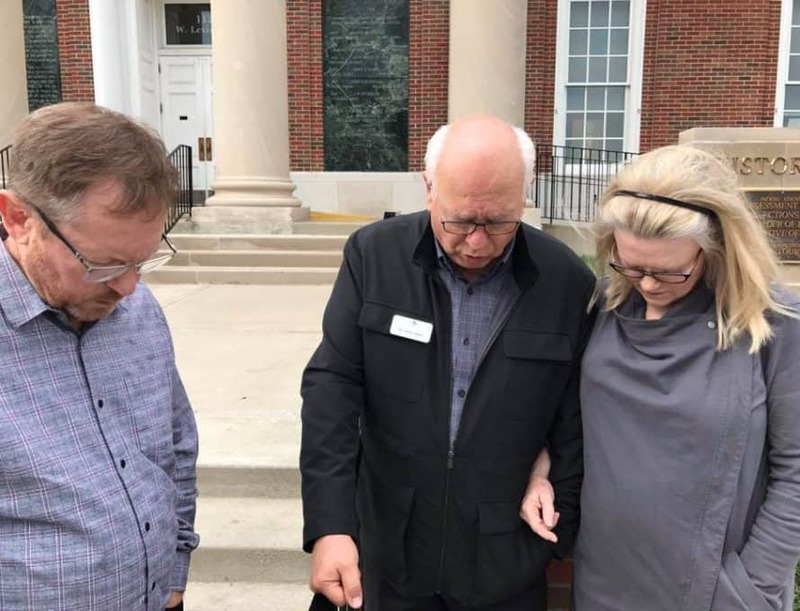 We are also very grateful for the local coordinators who contacted churches, county officials, and in many cases law enforcement to join us for a few moments for prayer on the courthouse lawn. Let me be the first to say, Missouri has some of the most magnificent county courthouses anywhere in the world. Most are stately representations of bygone craftsmanship that was replaced by far too much of today’s utilitarian architecture. Of course, when some of these were built, inside toilets were a new thing in most homes and an outhouse sufficed at the courthouse, too. So many of these old buildings had to be retrofitted to accommodate modern sensibilities, which includes indoor plumbing, electrical power, heating and air conditioning. Many things have changed around the courthouse, yet the work of this jurisdiction remains the same: to weave the legal fabric of a community together. One of the things that has not changed is the diligent work of many people in our communities who work in some role for a county or municipality. Some of these diligent people consider their work as a “calling” to assist the common good of the citizens living in their respective counties/cities. We have met some good and godly county leaders and law enforcement officials who express their faith through their service, and many are not shy about verbally engaging in spiritual conversations about the Lord Jesus. In all of our missionary travel within our state, we have been amazed at the number of opportunities the Lord has afforded us to engage in gospel conversations about the Lord Jesus. That is who we are—we are witnesses of the grace and power of the Lord Jesus to transform lives through faith from the inside out. Just this past week, we heard the story of too many people whose families were broken—lives that were broken. They were on a journey to somewhere, and strangely something has interrupted their lives and they did not know why. And we could guide them to see that it is the Lord Jesus who loves them and He is drawing them to Himself. Oh, the power of God unto salvation! One other thought that is somewhat overwhelming. We all owe deep gratitude for those who fought and spilled their blood and lost their limbs to guarantee our freedom to pray publicly on the courthouse lawn. If you see a veteran, at church or the restaurant or on the street or even at the courthouse, express to him or her all the gratitude the Lord gives you freedom to share. Never assume because they fought for your freedom that they are freed personally from the penalty of sin. Listen to their stories and tell them the story of God’s amazing grace that changed your life and set you free. If we will strike up a conversation, more often than not they are listening.